Aunt Jo's mother--Clara Louise Baumgardener Hufford's flag. "During the Civil War when Lancaster, Pa. was in danger of the Southern army marching into Lancaster via York, (before Gettysburg), Anna Louise Kurtz Baumgardner (Mother's mother) got her young daughters (Mother + Aunt Anna Cross) and their friends to make this flag out of materials she had--to keep the girls busy and less frightened." "The flagpole is in the laundry." The design of the flag is endearing. Its large, puffy central star is surrounded by two wreaths of stars and groupings of two or, in the case of the bottom left corner, three stars, in the corners of the canton. The canton rests on the "blood stripe", which is often thought to be a trait associated flags made during war time. It extends just four stripes high, and is sewn into the fifth red stripe. The white stripes and stars of the flag are made of cotton fabric, and the red stripes and blue canton are made of a very fine, soft merino wool fabric, rather than a coarse wool bunting typically seen on flags of the era. The mix of fabrics matches the oral description of the flag as being made from materials that they had at hand, an aspect that makes such rare homemade flags of the Civil War period so endearing. The crude irregularly cut stars and imperfect stitching also is wonderful evidence that the young girls were involved in making the flag. 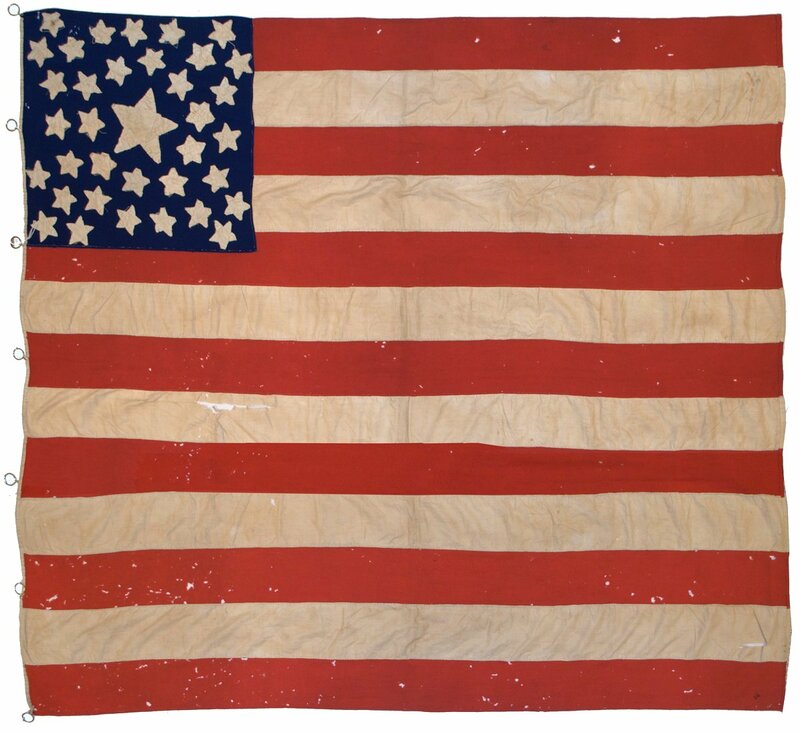 The flag has all of the endearing charm one would wish for in a homemade flag of the Civil War, and is a wonderful example of a Civil War period medallion flag and an important flag in the Rare Flags collection. Note: Another letter, written by Caroline M. Hufford-Anderson in August, 2002, provides additional information about the Jo Weed's notes: "Written by Josephine Hufford Weed before her death in about 1965 (possibly 1966 or 1967). The Hufford family, Rev. Rufus Huffort + his wife Clara lived in Reading PA at 122 N. Fifth St. in a big house with their daughters Anna, Josephine, Arie, and two or possibly three more whose names I cannot recall, and their son Rufus, called "Rip". He survived the sinking of a torpedoed ship--[was it the Lusitania? or another?] off the coast of Ireland at the beginning of World War I, and wrote an interesting account of his adventures which is somewhere in the collected papers of Howard S. Hufford." Click here to learn more about the "blood stripe".